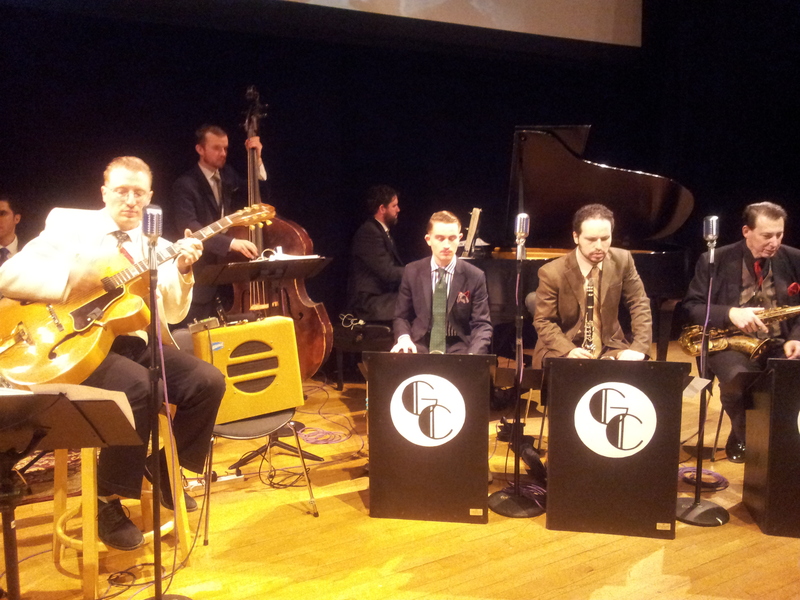 Glenn Crytzer & his Savoy 7 at Swing Remix on Saturday night. Superb swing, hinting at late 20s and early 30s. Day 4 was Saturday and we had a great day. Weekend time so we hung out in the morning with family who we’re staying with and went for a walk down Union in Brooklyn. After a coffee, and a tiny expensive sandwich from a much too pretentious café we went back home to prepare ourselves for the big Swing event of the week: Swing Remix at the JCC center in Manhattan with the band Glenn Crytzer & His Savoy Seven. Certainly after the ridiculous sandwich we needed some REAL food so we found ourselves at Utopia a …you’ve guessed it…DINER on Amsterdam Avenue. The food was….. YUMMY and so much of it!!! Look at the photo here! Indeed we were a bit worried because thirty minutes later we would be on the dance floor!!! Swing Remix was signalled to us by its organizer Paolo Pasta Lanna after he saw a post I created in NYC Swing Dancers asking for info. The NYC Swing Dancers page is really cool and full of friendly and immediate advice. Like it on FB!! It turns out that Paolo and I had already met last year in Rome at Lindyhop maestro Eddy Ceccarelli’s birthday party and then at Formello Jazz Festival where I was singing on stage. A dancer, teacher and event organizer, Paolo is one of the cornerstones of the Lindy Hop revival and development over the past twenty years. Paolo’s definitely making it back to Italy this year. He’s already booked in for July with the further possibility of collaboration with events in Pescara and Rome. Can’t wait to have him back !!!! Don’t miss his individual style and excellent and detailed teaching! Utopia…. it’s the name of the diner! On Amsterdam Avenue in Manhattan. 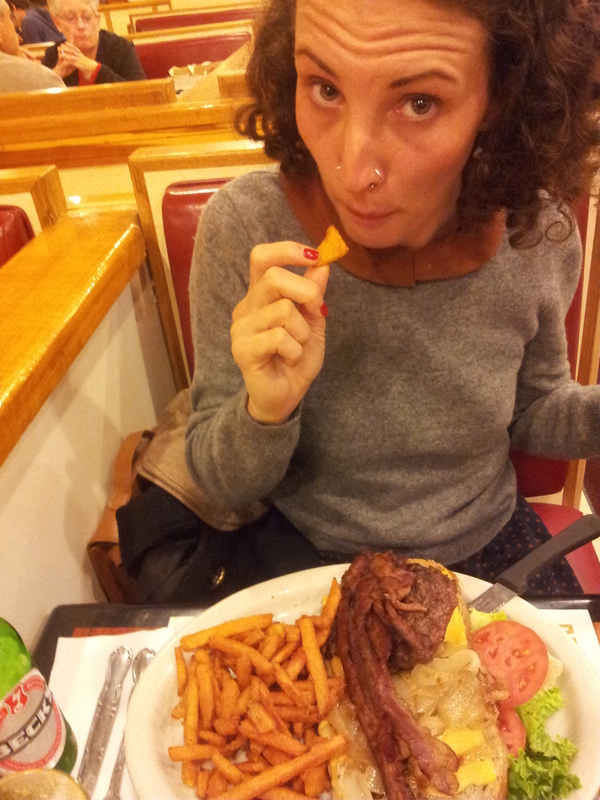 Alice tucking into a “small” meal… 30 minutes later she was on the dance floor at Swing Remix !!!! I also had the pleasure again of meeting Catrine Ljunggren who is visting Rome in July with Chazz Young for what promises to be a great workshop! Caterine and I first met in Rome. She still thinks I’m American and I’m sure she’s Norwegian !! We left the building at the end of the night with Glenn and walked to the subway where we chatted about music and the added value that being a dancer has (Glenn is also a dancer) when playing Swing! I understand this perfectly and think of my good friend and mentor Giorgio Cuscito.